The study draws on the National Household Travel Survey, which was conducted in 2001-2002. To put this finding in perspective, the United States consumed about 136 billion gallons of gasoline in 2002. So public transit, which was responsible for 0.07 percent of all surface vehicle miles traveled (in the U.S. in 2002) reduced national energy use by the equivalent of three percent of total gasoline consumption. The estimated savings in petroleum use from public transportation can also be expressed in terms of greenhouse gas emissions. Carbon dioxide (CO2) is by far the most prevalent greenhouse gas emitted from motor vehicles. Each gallon of gasoline burned releases 8.9 kg of CO2. The total effects of public transit availability reduce CO2 emissions by 37 million metric tonnes annually. To put this in perspective, in the U.S. in 2002, surface transportation emitted about 1,600 million metric tonnes of CO2. The 37 million metric ton reduction from public transit is equivalent to 2.3 percent of all surface transportation emissions. Another way to put this into perspective: According to the authors, the 37 million metric ton CO2 reduction is equivalent to the electricity used by 4.9 million households. What if we in the United States used transit at higher rates — like the Canadians or the Europeans? APTA’s earlier study, Conserving Energy and Preserving the Environment, provides the conversion factors. If we used public transit at the rate Canadians do, we would save about 260 million metric tons of CO2, equivalent to 16 percent of surface transportation emissions. If we used public transit at the rate Europeans do, we would save about 370 million metric tons of CO2, equivalent to 23 percent of surface transportation emissions. The Broader Connection between Public Transportation, Energy Conservation and Greenhouse Gas Reduction, by Linda Bailey, Patricia L. Mokhtarian, Ph.D. and Andrew Little, prepared by ICF International, Inc. with funding from Transit Cooperative Research Program of the Federal Transit Administration. March 2008. Conserving Energy and Preserving the Environment by Robert J. Shapiro, Kevin A. Hassett and Frank S. Arnold. Commissioned by the American Public Transit Association. July 2002. 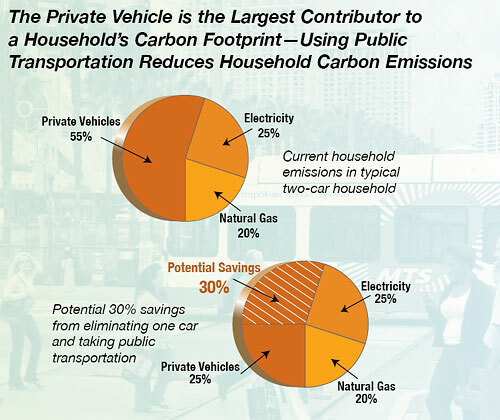 Public Transportation’s Contribution to Greenhouse Gas Reduction, by Todd Davis & Monica Hale. Prepared by Science Applications International Corporation (SAIC) with funding from Transit Cooperative Research Program of the Federal Transit Administration. September 2007. APTA Online Publications and Surveys — Many additional sources with information about the benefits of public transit. Good information. I realize that our challenge is so very complex that we have to break it down into bite-sized portions. I also realize that we, unfortunately, need to convince folks that less cars and travel time can actually work for them in their everyday lives. However, the future of our communities ultimately is related to the health of our natural environment (not simply the built env.) and the most important reason for increasing walkability, development density, irrigation restrictions, etc. is to assure that there will be food, clean water, etc. for future generations. Today’s great place making must be done with the environmental limitations of to tommorrow in mind; not because the price of gas will increase and put a dent in our pocketbooks.